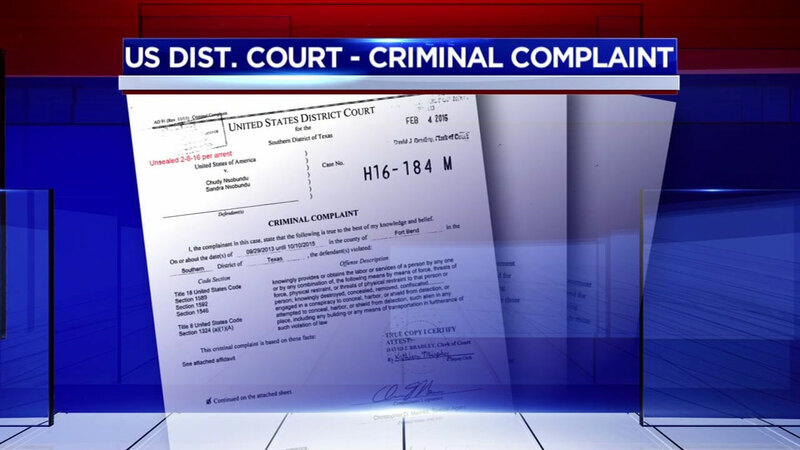 HOUSTON (KTRK) -- A Katy couple has pleaded guilty to charges related to forcibly holding their live-in nanny against her will for more than two years. Sandra Nsobundu pleaded guilty to charges related to forced labor and her husband, Chudy Nsobundu, pleaded guilty to visa fraud. The victim, a Nigerian woman, allegedly was forced to sleep on the floor and only eat whatever food was left over from previously prepared meals; if she wanted milk, she'd have to strain it out of the children's cereal bowls. She wasn't allowed to watch TV, use warm water to bathe or communicate with her family. Sandra Nsobundu is also accused of dragging the victim by the hair and hitting her across her face because she didn't like the socks the victim put on one of the children. Authorities arrested a Katy couple accused of forcibly holding their live-in nanny against her will for more than two years. Chudy Nsobundu knowingly misrepresented information under oath on the visa application to increase the chances of approval and to hide the fact that the victim would be working as a housemaid and nanny under conditions not in compliance to labor laws, court documents stated. According to documents, Sandra Nsobundu took the woman to the U.S. Embassy in Lagos, Nigeria to obtain the visa. There, documentation was given that indicated the victim did not speak English well and that she needed to travel to the United States for her niece's graduation. Authorities say the couple held the nanny against her will, using the passport and visa as a tool to force her to work. The woman was forced to believe that failure to work would result in serious harm to her, documents stated. 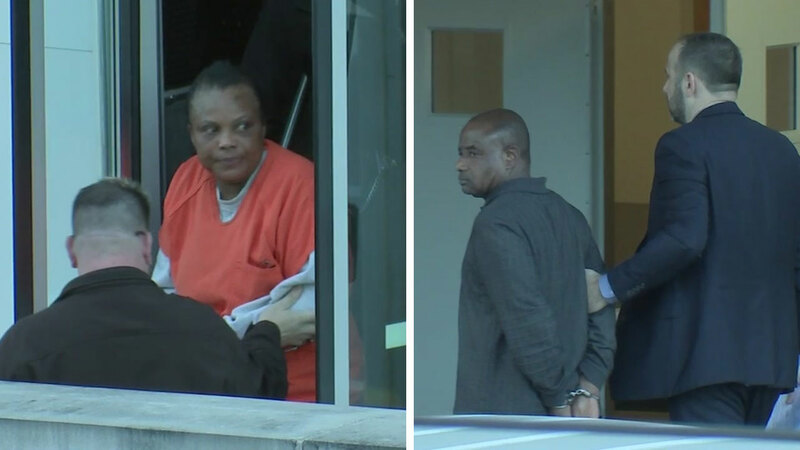 During two separate hearings, the couple was ordered to turn in both their United States and Nigerian passports as a condition for getting out on bond. Court documents state the couple also threatened to send the victim back to Nigeria if she did not comply with their labor demands. The victim was rescued October 10, 2015 after someone submitted a tip to the National Human Trafficking Resource Center. Sandra Nsobundu faces a maximum of five years in prison, while her husband faces up to 10 years. Both could also face up to a $250,000 fine. A sentencing hearing has been set for January 4, 2017.